It’s been a while since I’ve updated you all on a few things. I apologize in advance because there is going to be a flurry of activity this week, but it all good stuff and I think you’ll be excited. I have had a lot of people ask me when Deliver (The Blades of Acktar #4) will release. The short answer: I don’t know yet. The long answer: The first draft is written. That’s the first big step. Now that November is over, I plan to spend December revising. The revised draft should go out to my editor and early readers in late December or early January. Then it all depends on how long it takes for my editor and early readers to go through it and send it back to me, and how many changes I have to make in the second revision. Then all the publishing stuff and proofreading. Right now, I’m hoping for a March release, but I’m making no promises. I don’t want to rush and give you a sub-par book. Before you despair too much, keep reading for an update on everything I plan to publish in the next few months. 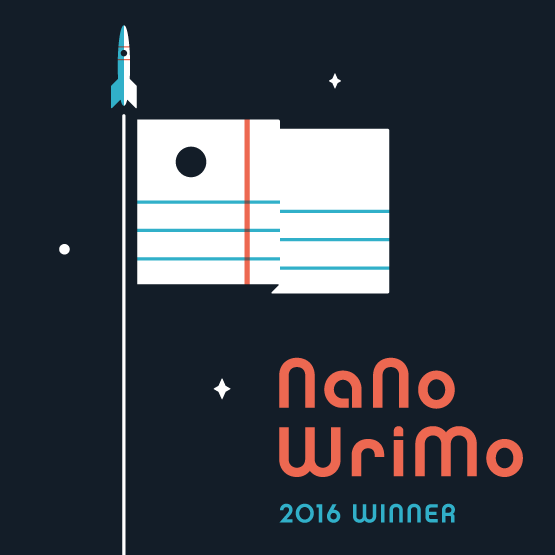 In case you don’t know what that is, NaNoWriMo is National Novel Writing Month. In November, authors all over the world commit to writing 50,000 words in 1 month. Yes, it is as crazy as it sounds, especially for writers like me that also work a day job. To put this in perspective, since working my current full time job, I have never written 50,000 words in a month. My highest word count was roughly 30,000. Somehow, I needed to find time to write an extra 20,000 words. I did it. Not really sure how. Actually, I do know how. I pretty much did nothing but write and work the entire month of November. But, it was worth it. What does this mean for you, my amazing readers? Well, obviously, I wrote 50,000 words of new Blades of Acktar stuff. That’s a lot of words that will be coming your way. If you’ve been keeping track, I have first drafts of Book 4, a novella, 4 short stories, and a few random backstory scribbles waiting in line to be published. You might be wondering when in Acktar all this cool stuff will finally make it your way. Here’s the tentative schedule. Things might change, and I’m making no promises. Destroy (The Blades of Acktar #3.5) releases as Kindle only – this is the novella on the Resistance Leader that gives both backstory for when Respen took over and some new information on what happens immediately after Defy ends. This novella is something of a prequel-sequel that spans about 6 years of time. It isn’t necessary to read this book before Deliver, but it gives more insight into certain characters. Destroy releases as paperback with all the short stories released as part of the launches for Destroy and Deliver included as bonus content. Some of the other random backstory scribbles will probably also be released during one of the launches as freebies on my website. Yes, you read that right. The next Blades of Acktar release is planned for the end of THIS MONTH. It’s a novella (though technically long enough I could call it a short novel) and releasing as a Kindle ebook only at this time, but still. That’s only a few weeks away. I might be kinda freaking out at this point. Later this week, I’ll have a cover release for Destroy and give out an official release date so you can count down the days. There will also be more information about Destroy then. What’s up with the Title of Book 4? All the previous titles in The Blades of Acktar are four-letter D words. Dare. Deny. Defy. All of them have a punchy, raw feel to them. And then there’s Book 4. Deliver. It’s a longer word. A little weird and outdated. Why would I pick it for the title of Book 4? To be honest, when I came up with the titles for the first three, I wasn’t planning a book 4. I only needed titles for three books. But I chose those titles very carefully. They are all commands. In some way, shape, or form, the characters are commanded to dare, deny, or defy throughout each of those books. They are also the theme of the books, both each individual book and all the books in the series. Finally, all three of those words can have dual meaning. Leith daring to stand up to King Respen is a good thing, but Respen daring to stand against God isn’t. Denying self is good. Denying Christ isn’t. See what I mean? Trying to find a word that started with D, was a command, captured the theme, was present in the earlier books, and had dual meaning was a bit of a challenge. Finally, I settled on Deliver. Criteria #1: Starts with D. Check. Criteria #2: A command. Check. Deliver isn’t a word we use often, even though it is used a lot in the Bible (or at least, in the KJV that I use), especially in the Psalms where the writers routinely beg for God’s deliverance from enemies. In this context, it means save. Even though the word deliver wasn’t used often in the books, it is essentially the prayer Renna prays A LOT. She wants God to save her (read: deliver) her from her enemies. Leith needs deliverance from his sins and his enemies. Pretty much any time the word save is used, you could substitute deliver. I also noticed that the word deliver was used in a few of the verses from Daniel that I choose to begin the books with. Another tie in. Criteria #4: Present in all three books. Check. Remember I mentioned the word deliver is used in the Psalms? Especially in the Psalms written by David. The Bible stories about David continue to play a role in the theme and shaping the characters in book 4. Criteria #3: Captures the theme. Check. Now to the tough one. Dual meaning. The cool thing is, the word deliver has the most complicated dual meaning of all of them. Dare, deny, and defy have the same meaning that can be directed in two different ways. Deliver as a word has two different, and in many ways, opposite meanings. On the one hand, it means to save or to be taken out of. Saved from enemies or sin or bitterness, etc. On the other hand, it means to surrender or to be handed over. (like delivering a package or delivering oneself to the enemy). See what I mean by opposite? This one word means both to take away from and also to hand over. But in a way, these two definitions work together. To be delivered from bitterness, we need to surrender our own pride and hurt. To be delivered from our enemies, we surrender our need to rescue ourselves. Because of God’s deliverance from our sins, we surrender our lives to Him. There’s also the negative. There are those who surrender their lives to their bitterness and hatred. They are delivered into the hands of their enemies. I’m already having fun using this duality in the book so far, and I’m brainstorming ways it will come out into the ending. The word deliver might not be as noticeably used in the book the way dare, deny, and defy were, but any time you see the words save or surrender, that’s what I’m thinking about when I write it. What do you think about the title? Love it? Not so sold on it yet? DO NOT KEEP READING IF YOUR HAVEN’T READ DEFY!!!!!!!!!!!!! Okay, you’re still here? Either you’ve read Defy or you are ignoring all the warnings. As many of you have heard already, I’m currently writing The Blades of Acktar book 4. Some of you might be a little confused. After all, the big bad guy got defeated at the end of Defy. What more is there left do to? Martyn didn’t die. In my original plan for Defy, he was supposed to die in the end battle saving Leith. But when it came time to write that scene, Leith realized what was going to happen and shoved Martyn out of the way. So I now had a live Martyn on my hands that I had to deal with. Besides, an alive ex-best friend is a whole lot more complicated than a dead one. Having Martyn die would’ve been the easy way out. He and Leith wouldn’t have to deal with the consequences of their decisions throughout the first three books. Leith could simply move on. But with Martyn alive? Let’s just say the tension between everyone is SO much fun to write! I could’ve ended it with Defy. You know he’s going to figure something out, but it would leave that question unanswered. I know some readers love unanswered questions like that in an ending. Personally, I’m one of the ones who wants to know the answers to things like that, especially if the author has made a big deal about it. Leith and Renna’s relationship still has a long way to go. If you add up the time they actually spend together during Dare, Deny, and Defy, you’ll realize that that week in the dungeon counts as their first real, quality time together. Due to the circumstances of thinking one or both of them would die, their relationship progresses quickly in that week. BUT, they are just BEGINNING their relationship. They have pretty much agreed to finally start dating at the end of Defy. Once again, I could’ve left it as is. You know where they are headed. But, they are the main couple of the book. Defy ends with more obstacles in their path than they even realize (she’s still a lady and Leith doesn’t fit with that world. He’s still an ex-Blade. They both have no clue what they are doing when it comes to a relationship). I felt their time building a relationship also needed to be told. Acktar is a mess. Most of the time, books don’t show what happens after a major war tears the country apart. We don’t see the rebuilding of Hogwarts. We don’t see Panem trying to build a new government. There’s so much hurt and bitterness in Acktar and in its new king. I wanted to explore what it takes for Acktar to either begin healing or tear itself apart, whichever comes first. Healing and restoration is really the theme of book 4. All of the characters (Martyn, Keevan, Leith, Renna, Brandi) have some healing to do. The whole country needs healing. Over all, my planned ending for Book 4 will bring the characters and the country to a place where they are truly ready to begin the next chapter, even if the series comes to a close. I can’t believe Defy has officially released and all the blog tour and party stuff is all over! As you can probably tell, I’m still playing catch up since the blog tour ended five days ago, and I’m just now getting around to posting a conclusion. *sigh* That’s the way things go. It’s Wednesday, and I’m still trying to finish my to-do list from last Saturday. All good stuff, though. The launch went amazing! You all were so enthusiastic! A big thank you to everyone who participated! A big thank you also to Jaye L. Knight for being a guest author at the Facebook party! The live character chat at the Facebook party went really, really well. So well, in fact, that I’m leaving the Facebook accounts I set up for my characters open. A few of you have even had Facebook recommend them as friends, which is cool. You might see them pop onto my Facebook page occasionally, and I might set up a live character chat again down the road. I’m glad it went well, since it was a total experiment. I half expected to have it fizzle out after the first half hour. Instead, the whole hour and a half flew by. A live chat has a much different dynamic than the blog post character chats I’ve done before. Shorter sentences, more small talk, little conversations going all over the place. Defy is currently available in both kindle and paperback on Amazon. The paperback is still in the process of being uploaded on Barnes & Noble, but I do have my personal copies in stock in you want to buy a signed copy directly from me. Oh, you’re still here reading and waiting for your update? Some of you may have seen in the back of your Kindle or paperback copy of Defy that yes, there will be a book 4. I know Defy really seems like the end. It was originally planned to be. But things didn’t turn out that way. I’m about 60,000 words into book 4 and I’m hoping it’ll be published sometime this coming winter. Can something broken ever heal? Martyn is broken. After betraying and torturing his best friend, he doesn’t belong anywhere in Acktar. Yet he can’t seem to make himself leave. Leith is broken. While healing from the torture he received at Nalgar Castle, Leith struggles to find his new role. But can a Blade ever truly move on? The country is broken. Bitterness divides town against town, neighbor against neighbor. Will they heal or deliver themselves to chaos? Defy releases today!!!!! Eeep! I can’t believe it is here already! The blog tour is in full swing. You can check out what has been posted already and upcoming posts here. Today is the last day of the giveaways on Goodreads for Dare and Deny. Be sure to check them out here and here and enter before it is too late! One final bit of housekeeping. The Kindle versions of Dare and Deny were both supposed to be on sale this weekend. You may have noticed that the sale on the Kindle version of Deny suddenly cut out. Never try to schedule a sale on one of your Kindle books right when your Kindle Select membership is set to renew. It makes it difficult, just saying. Due to this, the sale won’t go back up until June 2 and will continue to run to June 4. This is only on Deny. The sale for Dare went off without a hitch and will be running through June 3. Enjoy Defy and the rest of the blog tour! Don’t miss the Facebook party on June 2. It’s going to be a blast! I’ve been promising to reveal the cover for Defy sometime this week. I was holding off on sending out the ARC copies, hoping I’d get the cover in time to include it on the ARCs. Last night, I broke down and sent out the ARCs. An hour after I sent them out, I finally got the cover. It’d my own fault it was so delayed. I’m the one who based Nalgar off a ruined castle. If you signed up to review Defy as part of the blog tour or as one of the review copies, you should’ve received an email from me last night. If you didn’t, you might want to check your junk mail. If the email is still missing, please email me. Oh, yes, you’re waiting for the cover reveal, aren’t you? Once again, my cover designer did an amazing job. Click here to check out her website. She had to digitally recreate Nalgar Castle based off the ruins of Raglan Castle in Wales and my own tweaks. I’m amazed at how it turned out! 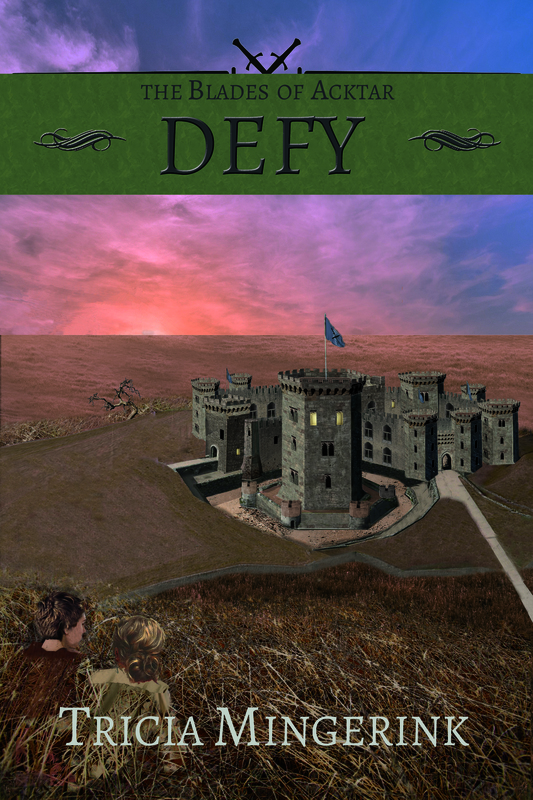 Without further chatter from me, here is the cover for Defy! As you can see by the title and the huge picture below, both Dare and Deny are now available as audiobooks! I am so excited about this, and once again, the narrator Jesse Dornan did an amazing job! Deny had its own peculiar challenges, such as two songs, but I love the end result! If you want to listen to the first five minutes of Deny, here’s a link. To celebrate, I’m giving away 5 free audiobooks, your choice of either Dare or Deny. Please see the end of this post for the Rafflecopter entry. Like before, Deny is only available as a digital eAudiobook. You can always burn CDs for your own personal use if that is how you prefer to listen. Or you can listen to the eAudiobook through an app or download onto an IPod or other device. There are a number of options. Whispersync (only available for Dare right now) – If you buy the ebook copy of Dare through Amazon, you can also buy the audiobook at a HUGE discount. Right now, adding the audiobook is only $1.99. That means, you pay $2.99 for the ebook, $1.99 for the audiobook, for a total of $4.98. As I said, this only works for Dare right now. It could take up to three months before Deny has this option (last time, I had to bug them until they finally processed Dare). Trial Audible Account – If you sign up for an Audible.com membership for the first time, you get 1 free audiobook for signing up. If you don’t want to pay the monthly fee, you can cancel right away. You’ll still get to keep your free audiobook. Only works once, but it is a great way to get one free audiobook if you don’t listen to audiobooks frequently, but would like to try one out. Audible Account – For those who listen to a lot of audiobooks (like me), an Audible account is amazing. You pay $14.95 a month for 1 audiobook a month. With this membership, you also get discounts on all other audiobooks you purchase. If you have a membership, you have the options to either use your $14.95 credit or purchase either Dare or Deny for $13.96. Amazon – If you don’t want to sign up for an Audible account, you can buy the audiobooks for full price at ITunes, Amazon, or Audible. I don’t know about ITunes, but full price at Audible is $19.99 while full price on Amazon is $17.46, so that would be your best option there. I know audiobooks aren’t for everyone, but they were a lifesaver back when I was in college and the only time I could “read” was listening to audiobooks during my commute. Nowadays, I still get a big chunk of my reading done during my hour-round-trip commute every day. I have a Release Date! No, that’s not an April Fool’s joke (because that would be cruel). Actually, I planned to announce this yesterday to avoid any April Fool’s fake outs, but being sick through that timeline out the window. My awesome cover designer Ashley is working on the cover, so hopefully I’ll have that to reveal shortly. And it’s time to start putting together all the launch stuff. Seriously, didn’t we just do this? Oh, and I got to finish the final edit and send it off to the proofreader. Details, details. Anyway, what are you looking forward to in a book launch? Before I announce the winners, I want to once again congratulate everyone on their submissions! Thirteen people sent in a total of 28 different submissions! Wow! I was amazed to have so many of you send in such creative pieces! Even if you didn’t win, I loved each and every one of them. Prizes: 2 $5 Gift Cards just for entering, choice of Dare, Deny, or Defy ebook for the winners of the different categories, and choice of signed Dare, Deny, or Defy paperback for the winners of the Fan Favorite and Author’s Favorite awards. For those who entered the fan art contest, I held a drawing for a total of 2 Amazon gift cards. The voting on this category was EXTREMELY close. It kept going back and forth between a couple of photos, but in the end, the below photo pulled away by a slim margin. I’m not sure how everyone managed to pick a favorite in this category! I was glad this winner was chosen by voting, because I never would’ve been able to choose! If you’d like to read it again to refresh your memory, click here. So many great videos! In the end, one video managed to pull ahead of the others. I loved so many of the drawings in this category! You guys are all so talented! Now, on to the two grand prizes: Fan Favorite and Author’s Favorite! To determine the Fan Favorite, I had all of your enter your top three. I then dumped the result in Excel and averaged the rank of each entry. You guys made a great choice, because Hannah’s artwork is amazing! Like I’ve said, I loved all of the submissions. It was so hard to choose just one for this prize! In the end, I decided to choose a submission that I adored, but it hadn’t already gotten a prize. Once again, congratulations to everyone! Thanks for your enthusiasm for The Blades of Acktar and for making this contest so amazing to look through! Fan Art Contest – Voting! Now that you’ve seen all the amazing submissions, the voting is now open! How you’re going to choose, I have no idea! All the submissions were so amazing, and I was blown away by all of you who entered. Even if you don’t win, please know that you have my deepest thanks for taking the time to put together a submission and participate in this fan art contest. In case you missed any of the posts or need a reminder, here are links for all the submissions: photos, drawings, fiction part 1, part 2, part 3, and videos. The voting will be open started today (March 19) and running to next Friday (March 25). I’ll announce the winners on Saturday, March 26. When you elect to follow my blog you will have the option of following by email or the wordpress reader. The email addresses you subscribe with is not made public to me in order to protect your privacy. For more info, click here. If you use the contact me form, I will receive your name and email address. This makes it possible for me to write you back. I will not share your email address.